Key funding source was the first to generate revenues that were used to build the Metro Rail system and a host of other rail and bus projects. Proposition A was the first of its kind to bolster the County's ability to respond to gridlock and mobility challenges in LA. Approved by voters in November 1980, Prop A is a half-cent sales tax dedicated to transportation funding. 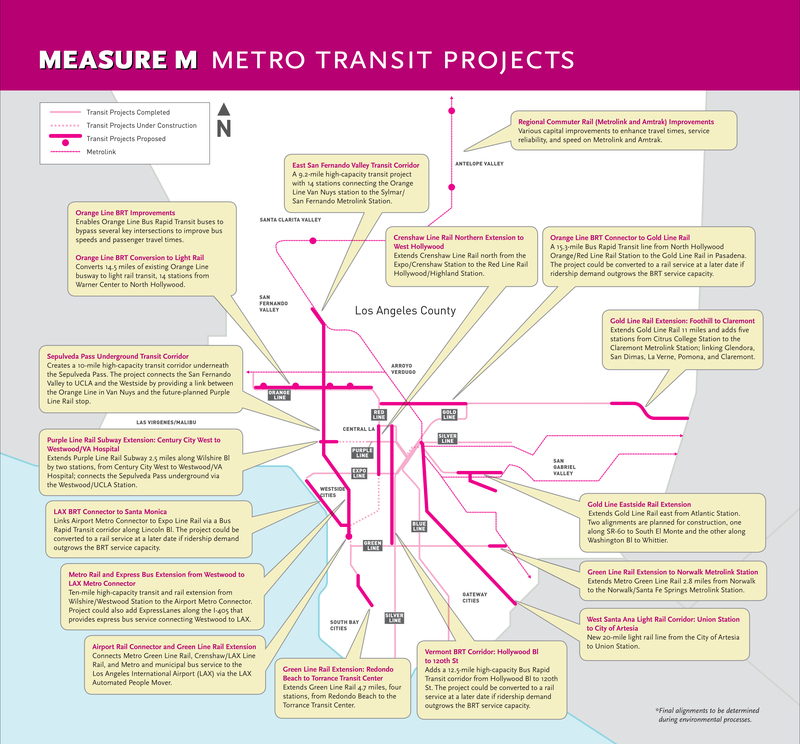 Prop A has funded municipal transportation projects, improved bus service and initiated plans for a rail system that continues to be expanded today. Between July 1, 1982 and June 30, 1985, bus fares were subsidized at 50 cents thanks to Prop A. Prop A also subsidized an unlimited use transfer charge of 10 cents; a basic monthly transit pass of $20; a monthly transit pass of $4 for the elderly, handicapped and students; and commensurate reductions in express fares. One-fourth of the funds go to Local Return Programs. These are local jurisdictions, including the 88 cities in the county as well as the unincorporated portion of the county. The monies help these entities develop and improve local public transit, paratransit and related transportation infrastructure. The funds are distributed on a formula basis by population. Local Return funds cannot be used for highways. Downtown L.A. to Long Beach. Completed (22 miles). The Metro Blue Line to Long Beach opened as initially conceived. Downtown L.A. to North Hollywood. Completed (16 miles). The Metro Red Line subway was opened to North Hollywood in 2000. The first section from Union Station to Alvarado St. opened in January 1993. The second section from Alvarado to Western opened in July 1996, while the portion from Vermont to Hollywood/Vine opened in June 1999. The Hollywood/Highland segment was ready in 2000. Century Freeway Corridor. Completed (20 miles). The Metro Green Line opened in August 1995. West Los Angeles (east-west) Corridor. Small Segment completed (one mile as part of the Metro Red Line). The Western Avenue "stub" can be thought of as the initial segment of a rail line serving this corridor. 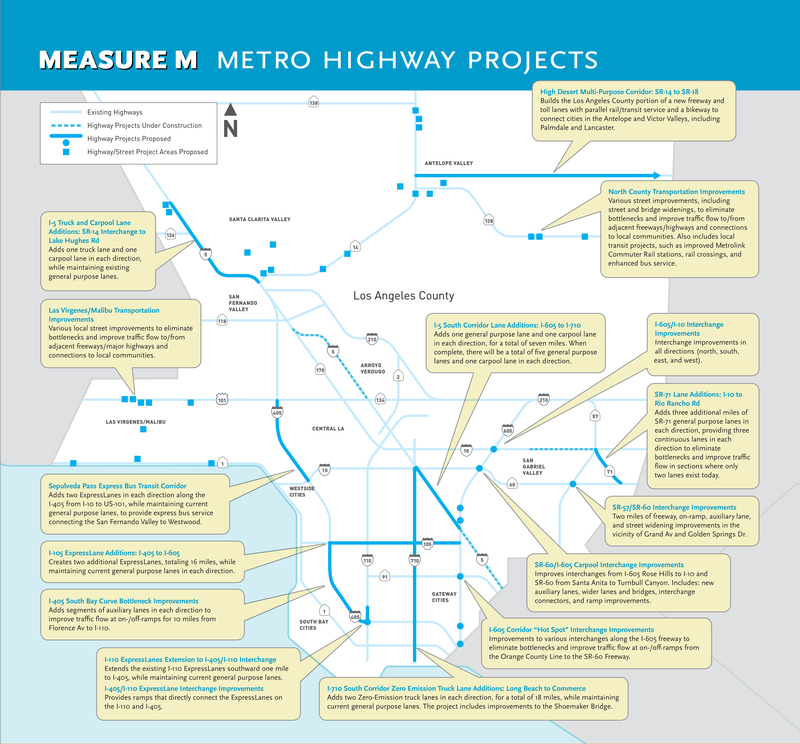 In 2005, Metro approved building the light rail Metro Expo Line to Culver City and a current Draft Environmental Impact Report is available for public comment to extend the line to Santa Monica.